Finishing on an 11-0 run, the Cleveland Indians have reached the baseball playoffs for the first time since 2007. And all baseball fans should celebrate. Because while the Cubs’ long World Series drought gets more attention, the Indians have not won since 1948. And unlike the Cubs, the Indians have tantalized their fans, coming within an out of winning in 1997 and being on the verge of the World Series in 2007 before heartbreak returned. Further, while the Pirates ended a longer baseball playoff drought this year (1992), Pittsburgh sports fans have enjoyed Steeler Super Bowl (2008) and Penguin Stanley Cup (2009) titles in recent years. (and Chicago enjoyed a Stanley Cup earlier this year). Cleveland has the woeful Cavs, the consistently losing Browns, and—until miracle worker Terry Francona became manager this year—the long disappointing Indians. The Indians success this year reflects Cleveland’s revival as a city, and deserves celebrating even if their time in the playoffs is short. When I saw 42-year old Jason Giambi (yes A’s fans, that Jason Giambi) hit a walkoff homerun last week to win a game for the Indians that their closer had seemingly given away in the top of the inning by allowing two homeruns, I knew that something beyond baseball logic was behind the Cleveland Indians success. We’ve seen such unusual actions on a baseball field before. Remember when the Red Sox in 2004 were down 3-0 to the Yankees and seemingly headed for a final defeat? And the bizarre series of events that soon followed, triggered by Dave Roberts’ stolen base? The manager in both cases was Terry Francona. 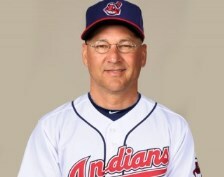 Francona is the best manager in baseball not named Bruce Bochy. And if he ever brings the Indians a World Series title he will stand alone as the greatest manager in baseball history, if not the most impactful coach of any sport. In October 2007 I suggested that fans whose own teams had been eliminated root for the Cleveland Indians, a strategy that also makes sense this year. I discussed Mark Winegardner’s brilliant 2001 novel, Crooked River Burning, which demonstrated the connection between the city’s fortunes and the team’s going back to the 1940’s. Indian fans have gone through nightmares rooting for their team. For example, Giants’ fans should consider how many times they have seen the replay of Willie Mays’ remarkable catch in the 1954 World Series on a long drive to center off the bat of Vic Wertz. Well, Indian fans also have to watch that play, which was among the many nightmarish events of a World Series that their 111-win Indians team lost in four straight. Cleveland’s fall after that 1954 debacle coincided with the Indians long decline. And this connection between city and baseball team has continued over the past decade. As the Indians have improved by fits and starts, so has Cleveland. And now that Cleveland seems to have avoided the fate of Detroit and is moving forward, so are the Indians—with miracle worker Terry Francona at the helm. If you look at the Indians roster top to bottom, there is no way they should have made the playoffs while the Angels and Yankees did not. Half the teams in the American League may have better personnel, but they don’t have the intangibles that brought the SF Giants two World Series and which have propelled the Indians this year. Baseball logic says a team without a closer doesn’t succeed—yet the Indians did so with the worst closer of any playoff team. Baseball logic also says players not used to playoff pressure falter down the stretch—yet the Indians played their best baseball in the last two weeks of the season. Unfortunately, if the Indians get pass the play-in game they host on Wednesday, they must face the Red Sox, who dashed their hopes in 2007. Francona’s return to Boston will be a great story, but the Red Sox look too tough for the Indians this year. But the Indians are the underdog, and those who favor that side in the broader society should attach themselves to the Indians as long as they have a chance. We’re looking at a Red Sox-A’s match up in the AL and a Dodgers-Cardinals contest in the NL. But with a touch of playoff experience and Francona’s genius, expect to see the Indians continuing their progress next year. Randy Shaw is Editor of BeyondChron. He dedicates this column to Sandy Nathan, who has never stopped believing in the Tribe.